I have tried white sauce in pasta earlier (link) but this time just wanted to try white sauce in spaghetti so tried this variation with mint white sauce. 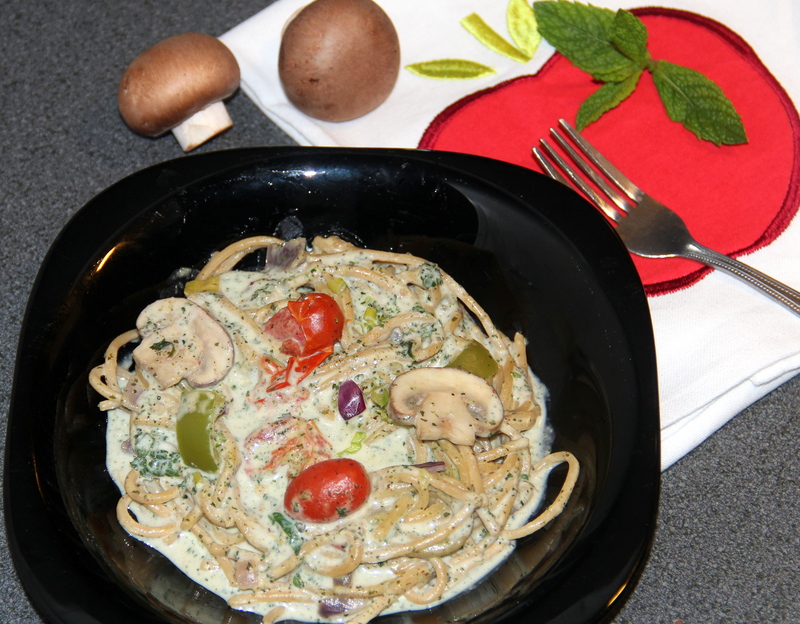 Here in this recipe spaghetti is tossed in low fat minty white sauce along with bell peppers, mushrooms, cherry tomatoes, scallions, red onions. Enjoy this vegetable spaghetti in white mint sauce for breakfast or even for dinner. Bring a large pot of water to boil, add salt and spaghetti and cook for 5-6 minutes or follow instructions on the box. Once cooked drain and add olive oil mix well to avoid sticking each other. Heat oil in the skillet over high heat, add garlic, onions and cook for 2-3minutes. Add spring onion white, bell peppers/capsicum and cook for a couple of minutes. Add in mushrooms, tomatoes cover and cook for another 1-2minutes/until everything is cooked through. Stir in the white mint sauce, salt mix well and simmer until heated through. Posted on August 21, 2014, in International, Main Course and tagged Chitras healthy kitchen, drchdietfood, Spaghetti vegetarian recipe. Bookmark the permalink. 20 Comments. Ooh, never had this. Have to try it! Elisha – The great feedback and motivator…Thank you ! The veggie spaghetti sounds like such a great healthy summer dish! Last night while posting this I was totally sleepy so didn’t link up. …will do it now dear…..thanx a bunch…you are so sweet dear …. Mint?! Wow what a great idea! Thanx G:)….just tried as had fresh mints but felt worth trying and thanx to my dad who is giving me lovely thoughts . Thabx to you all and my dearie hubby for the support. .. I don’t have much experience using mint or any other herb, do you have any suggestions on how to get started integrating it into your cooking routine?